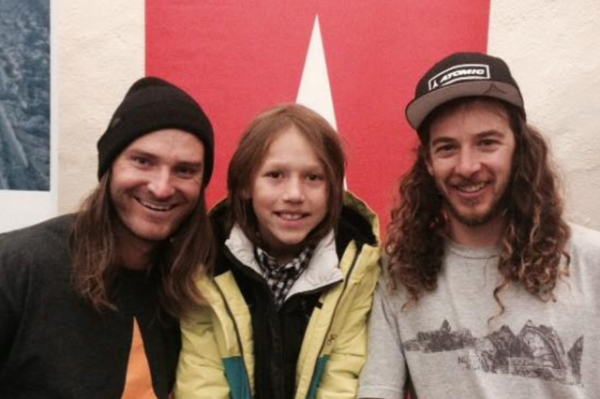 Check out the latest interview with Donovan Johnson, 11-year old big mountain skier on the Alpine Meadows Big Mountain team. We sat down with him to learn about why he loves big mountain skiing, his training before and during the season, and why he's raising money this season to compete. To start, can you tell us a little bit about yourself? Hello, my name is Donovan Johnson, I go by DJ. I just turned 11 years old and am in 6th grade and Tahoe Expedition Academy in King's Beach, CA. I have lived here (in Lake Tahoe) for 3 years now and love it. I used to play soccer but now I practice indoor rock climbing and big mountain skiing at Alpine Meadows. My favorite subjects are Science and Reading. I also like to blacksmith (at school), play the drums and play Terraria. I listened to your podcast with Teton Gravity Research Athletes and heard your first interview question so I’m going to ask you the same question. What will you be for Halloween this year? Thanks for listening to my TGR interview. I’m going to be Kylo-Ren from the new Star-Wars that’s coming out this December. He looks very cool and I like the lightsaber. Why is big mountain skiing your passion? Because I love the thrill of going in the air, hucking a cliff and coming down all natural terrains, stuff I have to walk to not take a lift up to. I have been doing it for two years now and even though the hiking first was hard and I was tired, I can walk almost anywhere now with skis. It’s like discovering a new world all the time. What are looking forward to the most about competing in big mountain skiing competitions? To feel accomplished and the thrill of winning with a possibility of losing and learning more to evolve. I like also competing against my own teammates. We push ourselves to go further and support each other all the time. I am still friends with them over Instagram because a lot of them do not live here. I read you also competed in big air ski competitions. Tell me about your training and some of your favorite tricks. My training was healthy eating, bacon, egg & cheese breakfast burrito every morning, Woodward Tahoe and gymnastics. I was lucky that I placed in those competitions but as I get older I can see that I need to train differently. Woodward Tahoe (that is a place where I can train with my jumping on trampolines and work on aerials and flips into foam pits. They have coaches to help you and it is very safe. So now, I am starting to train by indoor rock climbing to get stronger and biking to help with my cardio. Some of my favorite tricks are jumping the box, launching off big hills, and tail grabs. Do you follow a strict eating plan when you’re training for competitions? Do you have any advise for young people who want to get involved in big mountain or big air skiing? Yeah, you have to be ready to try a lot of new things and dedicate your time to it, on and off season. Like jumping off tall stuff, changing your plans at a moment’s notice since the mountain changes constantly. You have to really study your mountain and learn how to inspect the course and read the snow in the case of avalanche. Its lots of work and study, but it is so much fun it is worth it. Tell more about your Pledge It fundraiser and why you need to raise money to participate in competitions this year. I am starting to learn how much it costs to do all this and I want to help my parents as much as I could. I also want to learn more and get stronger. I read an article that many athletes are doing this since competition can be so expensive so I thought, I should try to and maybe I can get support and train to raise money to help me achieve my goals.You can support my cause here. Who is your favorite professional ski athlete, and why? Todd Ligare, he is always friendly and happy and always tries to brighten everyone’s day around him. I interviewed him twice so i go to know him pretty good. He was very supportive of my campaign and even pledged!! He taught me to keep trying and persevere when you get hurt or cannot do a trick (he go hurt twice and came back stronger). He also has another job other than skiing, so he taught me that I will have to work hard to achieve my dreams.